Online auction house eBay must have been pleased as punch on Tuesday after agreeing to offload the majority of its ill-fitting internet telephony outfit Skype for close to $2bn. The deal comes as something of a surprise, seeing as eBay wrote down the value of the Skype acquisition in 2007, admitting that it paid almost $1bn too much for the company in 2005, when it shelled out $2.6bn. According to eBay on Tuesday, this latest deal values Skype at a whopping $2.75bn, meaning eBay potentially wins out. Under the agreement, an investment consortium comprising Silver Lake, Index Ventures, Andreessen Horowitz (a recently launched venture capital firm led by Netscape founder Marc Andreessen), and the Canada Pension Plan Investment Board (CPPIB), will acquire 65 per cent of Skype for $1.9bn, with eBay retaining the remaining 35 per cent. Quite how eBay struck such a good deal is something of a mystery, especially in the wake of the firm’s rather worrying recent admission that it failed to secure rights to the VoIP provider’s underlying technology. In a filing to the US Securities and Exchange Commission (SEC) in August, eBay warned that Skype depends on key technology that is licensed from third parties. The third party in this case is Sweden-based Joltid, a peer to peer technology firm run by none other than Skype’s founders and ex-owners Niklas Zennström and Janus Friis. The technology in question, which eBay licenses from Joltid, affects Skype’s underlying peer to peer architecture and firewall traversal technology and the video compression/decompression. “Although Skype has contracts in place with its third-party technology providers, there can be no assurance that the licensed technology or other technology that we may seek to license in the future will continue to be available on commercially reasonable terms, or at all,” eBay said. Potential repercussions in the event of eBay’s failure to maintain these licensing agreements include the shutting down of the Skype service. 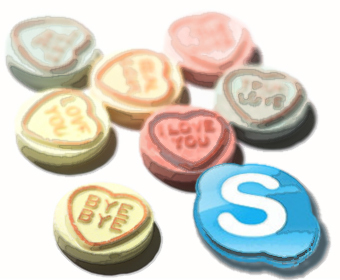 Skype generated revenues of $551m in 2008, a 44 per cent increase compared to 2007, with a user base fast approaching the half billion mark.